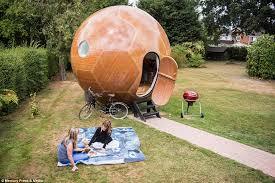 Is this a way to "conker" the housing shortage? What Makes Exeter Planning Different? Is this a way to “conker” the housing shortage? A former Rolls Royce engineer may have found the answer to the housing crisis and it’ll only cost you £21,000. Jag Virdie, 50, says he’s got the perfect solution for the Boomerang Generation returning home after university – Conkers. The £21,000 pods can be installed in a back garden in just one day and function as an independent living space for young people as they look to jump on the housing ladder. The spherical structures, called Conkers, measure almost 13ft (3.9m) in diameter and are made entirely out of materials sourced in Britain. Several of them can be fitted together to create space for a double bed, storage space for clothes, a kitchenette and even an en-suite bathroom with a toilet and shower. Jag also envisages them as a granny flat for elderly relatives wishing to maintain their independence, or a space that can also be customised as a glamping pod, a bar to entertain friends or even a science lab. Dad-of-two Jag, from Wistaston, Cheshire, said: ‘I envisage that people will look to live in The Conker as their home. The prices start from £21,000 plus VAT and then you can choose how you want it kitted out. ‘For an office space we have designed a three-metre long desk with drawers and a deployable table. I currently use the prototype as my office and for when people come and see me. ‘You can have it as a conference room with seats, a round table and a projector. ‘We have a glamping range where you can have a Conker with bunk beds, or single beds and even a double bed. They can sleep a young family of four. ‘You could connect a number of Conkers together to form a unique living spaces with bedrooms, living room, kitchenette and a bathroom. ‘We’re actually talking to a couple about providing an Alzheimer’s facility for their back garden. This would allow them to keep a loved one close by while allowing them keep their freedom. The idea of creating the Conker as a potential living space came to Jag after speaking to a friend about his daughter who was still living at home. From there, he revisited an old design of his children’s tree-house, which they had also called ‘The Conker’, and developed the idea from there. ‘Years ago I designed a suspended tree-house for my children – a perfect sphere we hung from a large tree at the rear of our garden which we called ‘The Conker’. ‘I wondered if something similar couldn’t be created to serve as a self-sufficient living space for a student or first-jobber. Jag has optimistic projections for the year ahead and hopes with each order he’ll be able to create numerous different designs with different usages. Jag said: ‘The business is a brand-new start up and we are just in the process of completing our first two orders. The Conkers we’re currently making will sit on the edge of a river at a glamping site. One of Jag’s main aims was to make sure the Conker had ‘rock-solid environmental credentials’ which means they are designed to last forever and even harvest water. All materials are sourced in the UK and the pods themselves were designed and assembled in Cheshire. Jag said: ‘It was important that they had absolutely rock-solid environmental credentials. As the Conker is made of aluminium and recycled plastic it has a long service life. ‘Because of the spherical shape of the Conker when it rains all of the water drips down the sides, where it can be harvested and stored in tanks. ‘This could then be purified and reused in the shower or the kitchenette. It’s got a heat-recovery system so in the winter when people are in there, it will trap all the heat inside. ‘We source all of our materials locally. Everything is designed in Cheshire and all the components are made in the UK. ‘People looking to buy one of these in their current form wouldn’t need to go through all the rigmarole of planning and it could be installed in just one day. Copyright @ Paul Barkley Ltd 2013 - 2014.